The Easter lily is to the Christian spring holiday for which it is named what the poinsettia is to the winter holiday of Christmas. Being a member of the genera of true lilies, the Easter lily (Lilium longiflorum) is a rather tender bulb which, if properly cared for, becomes a perennial plant producing new blossoms year after year. These now hugely popular spring flowering plants originated in Japan and were introduced into the United States in the early 1900’s. The plants are now commercially cultivated primarily in the California and Oregon coastal areas, where the bulbs are environmentally manipulated (forced) to produce blooms just in time for the Easter holiday. 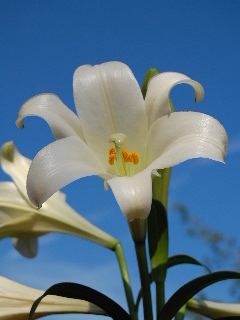 The Easter lily is, in fact, actually a summer-blooming plant which if allowed to acclimate itself naturally to a moderate (not extended periods of extreme cold) environment, becomes an established member of the summer flower garden, producing its large trumpet blooms in June or July. 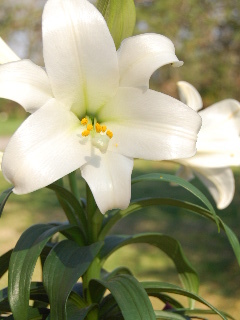 When selecting Easter lilies from the store, look for ones that have some full blooms and some fleshy swollen buds that will soon open into bloom. This will maximize the flowering time period of your indoor plant. Give your Easter lily a prominent location in your home, providing bright indirect light but not full sun on the delicate blossoms. Don’t over water and, if your plant container is surrounded by decorative foil-like paper, be sure water doesn’t stand in the bottom of the paper, causing the soil and roots to remain soggy. Also, remove blossoms as they fade to assure an over-all attractive appearance of the plant. After all blooms have faded and been removed from your Easter lily, continue to water sparingly. When all danger of frost has past, you may re-locate the plant to your outdoor flower garden, choosing a sunny location in well-drained loose organic soil. Provide adequate mulch around the base of the lily so the roots and soil do not become too hot from the sun. The foliage will continue to turn brown and wither; cut this back as it does. Soon new foliage will emerge and grow throughout the remainder of the summer growing season. When this foliage dies down in the fall, cut it back to ground level, fertilize lightly with bulb food, and add another layer of mulch which should protect the lily throughout the winter, provided your area is not subject to extended periods of hard-freezing weather. In the spring, pull some of the mulch back as the new growth of your Easter lily emerges. Again, fertilize lightly with a good bulb food and continue to add small amounts of fertilizer periodically until mid-summer. It is possible that your lily will produce blooms during the first summer in its new outdoor home. However, the greater likelihood is that it will not bloom during that first outdoor season but rather exist only as a foliage plant, producing its beautiful natural trumpeting blooms the second outdoor season and beyond. Water normally, as you would the rest of your flower garden, increasing irrigation amounts only when rainfall is not adequate.